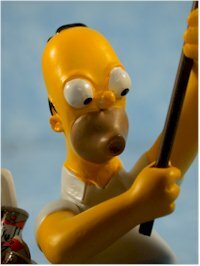 For the last year, Hamilton has been producing a series of small Homer Simpson themed statues, called The Misadventures of Homer. First in the series was Woo-Hoo, followed by D'oh! Nuts!, then Asleep On The Job, and now Gone Fission. Each one is a 'limited edition', although it's only limited in the sense that they have a 95 days for casting. You can cast an awful lot of little ceramic statues in three months. None of the sets are based on episode specific situations, and are simply from the mind of the sculptor. Still, Simpsons fans and collectors have been happy with the series so far. Call 1-800-228-2945, and tell them you'd like to order the Misadventures of Homer series. I don't know if they still have the early statues available, but they might. Clearly one of the three most important factors, the sculpting on this piece is one of the best so far. 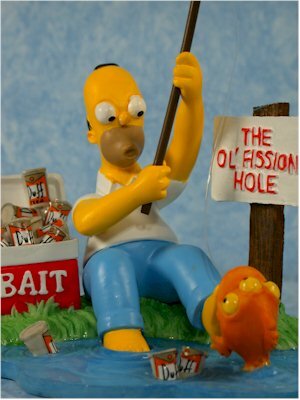 Homer is nicely done, fitting his look on the show pretty well. He's a tad thin, or perhaps his head is a tad big, but overall he looks great. 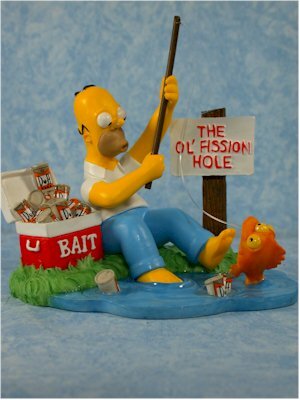 Homer is in the process of catching Blinky - yea, I know, nothing like that ever happened on the show, let alone having some place called the "Ol' Fission Hole". At least he's drinking Duff. And there's plenty of Duff available in his bait box. The base is great looking, and the grass and water look very realistic for the cartoon style. The paint ops on these sculptures hasn't been quite as nice as the sculpts, and that's true again in some places on this one. The eyes on Homer are a bit sloppy, and some of the colors, particularly his pants and the orange on Blinky, aren't as uniform as they should be. I was very impressed with the paint work on the base though, particularly the water. You can almost here Blinky splashing around in the water! I think this is my favorite of the four statues in the series so far. You can never go wrong with Blinky, but they went the extra mile on this set in several areas. They managed to fit a lot in a small area, and did a nice job with multiple textures. 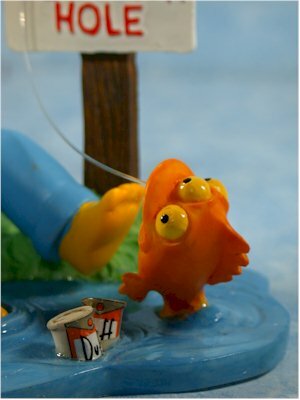 They even went with real fishing line for a touch of realism. These run $20 plus shipping. It's a decent price for this style and size of ceramic statue. Yep, this one got a better score than the previous three. Not surprising though, since I already mentioned it was my fave so far. I really wish we did get episode specific ones - a Mr. Plow scene, Homer dressed up all in black, or Stonecutters scene would be great - but at least these are fun. As I mentioned earlier, give them a call at 1-800-228-2945, and tell them you'd like to order the Misadventures of Homer series. I don't know if they still have the early statues available, but they might. Avoid ebay - you should be able to still find these at retail or less.